Looking for something to cook to cheer you up on a gloomy day? Something to remind you of sunnier days and beach bliss? Have a Friday night alone with your significant other and don’t want to spend hours cooking? Try this yummy grilled chicken and pineapple for two. Oil and preheat grill to 375 degrees. 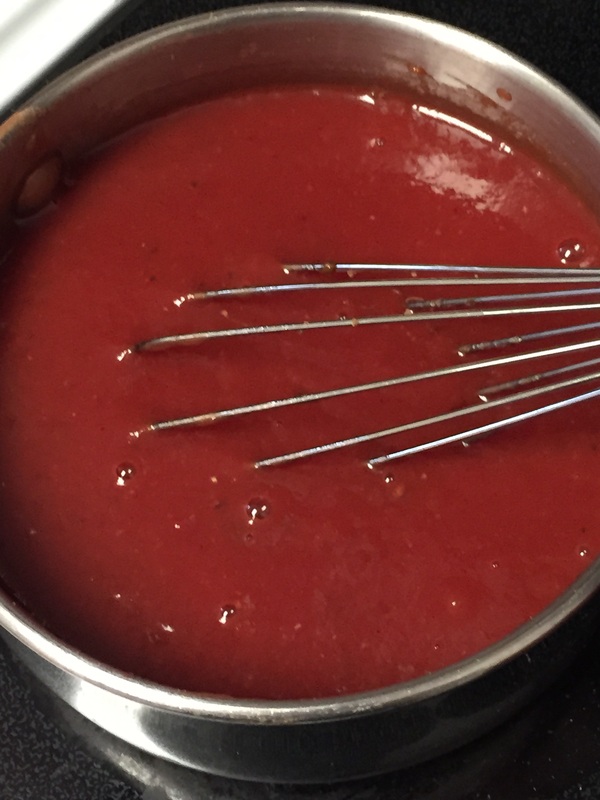 Whisk marinade ingredients together in a bowl and set aside. In a shallow dish (I prefer a pie pan) arrange the pineapple and pour 1/2 of the marinade mixture over the top. Toss to coat and set aside to marinate. I find that the pineapple wedges are more grill friendly than rings, which while lovely, can be fragile when it comes to grilling. Trim and pound out 2 chicken breasts. The chicken breasts are pounded thin prior to marinating to speed up the cooking time and give a little more surface area for all of that yummy marinade. Add to the remaining marinade and set aside. Marinate meat and pineapple for at least 30 minutes, tossing occasionally in the marinade. Add the pineapple to one side of the grill and chicken to the other. Put the grill lid down and leave it alone for 5 minutes. Flip and repeat another 5 minutes on the other side. Sometimes an extra flip and 5 more minutes is required here (depending on the thickness of your chicken). When the juices run clear from the chicken and the pineapple is covered with grill marks, remove from the grill. Rest for 5 minutes. Slice the chicken and serve with rice. Garnish with green onions, cilantro and sesame seeds. I use forbidden black rice for a little extra dramatic flair. 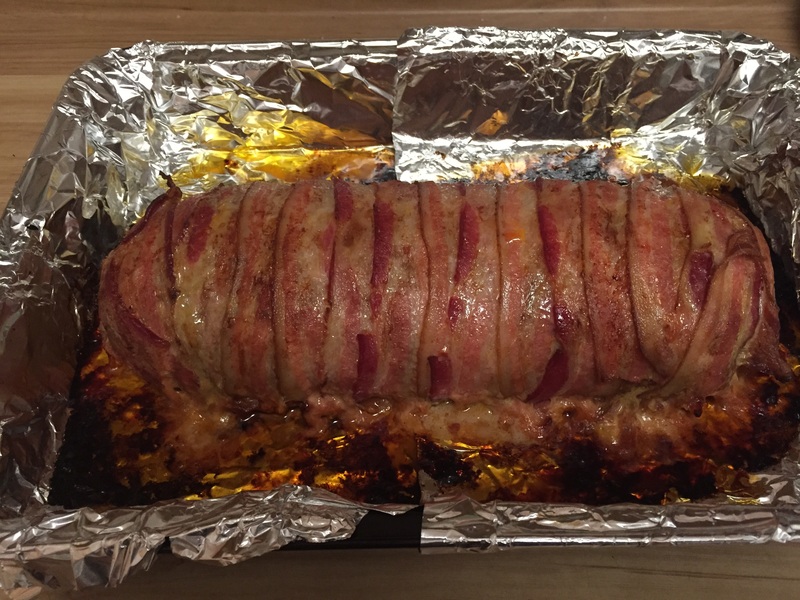 What can I do with this boring pork tenderloin? This is a question that I ask myself all of the time when considering the “other” white meat. As a main course, this whips up in no time and has enough flavor to keep things interesting. Combine all marinade ingredients into large bowl, add pork and toss. Let this marinate for at least 30 minutes. Melt the butter and the olive oil in a heavy skillet and add the garlic. When the garlic begins to sizzle add the mushrooms. Cook garlic and mushrooms over medium heat for approximately 10 minutes. Add vegetable stock and stir. 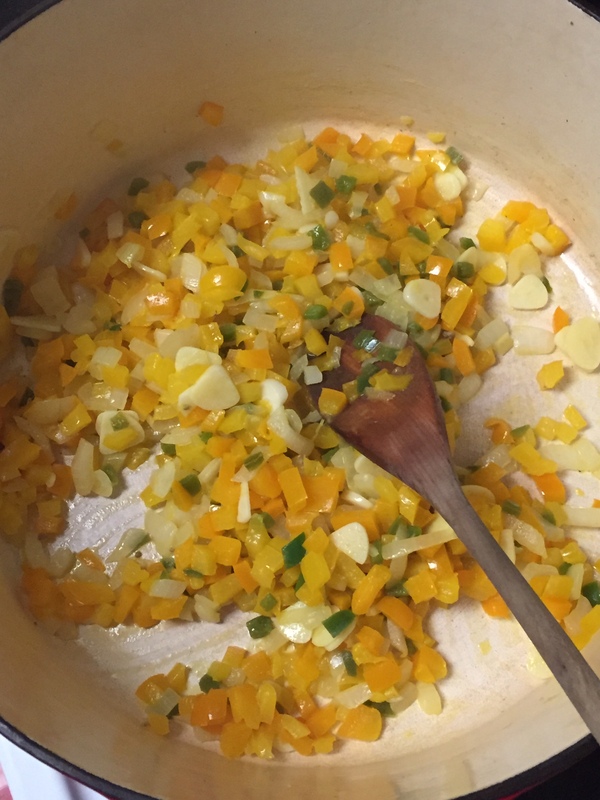 In a separate bowl, combine preserves, thyme, salt, pepper, and mustard. Pour the preserve mixture into the sauce. Simmer for 10 minutes. While sauce is on final simmer, sear medallions on the grill for around 3 minutes per side (just long enough to make some marks and get a good sear). Remove the pork from the grill. Add grilled medallions to the sauce and coat well. Turn off the heat and put the lid on the sauce. 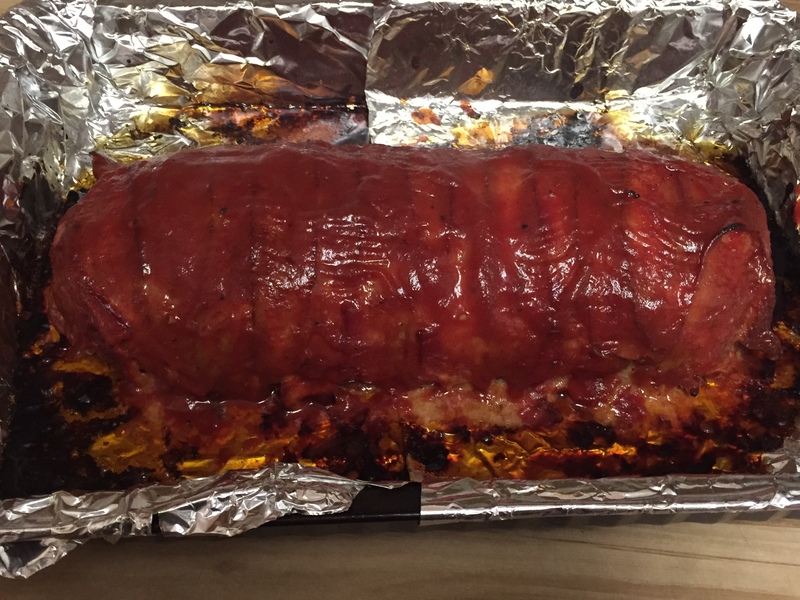 Allow the sauce and pork to rest with the lid on for 10 minutes. To serve, sprinkle with green onions. Spring time makes me want to fire up the grill and eat something that has been cooked outside. This chicken is light and enjoyable for spring time grilling. Combine ingredients for marinade and chicken, skin on, in a bowl and allow to marinate for 1 hour in the refrigerator. Heat up olive oil over medium heat and saute the garlic until it begins to soften, but not brown. Add the sage and saute for another minute. Add lemon juice, honey, vinegar and mustard and stir until well combined. Add 1 cup of dry Riesling and a pinch of salt. Simmer on low heat until reduced by half. Set aside to cool. 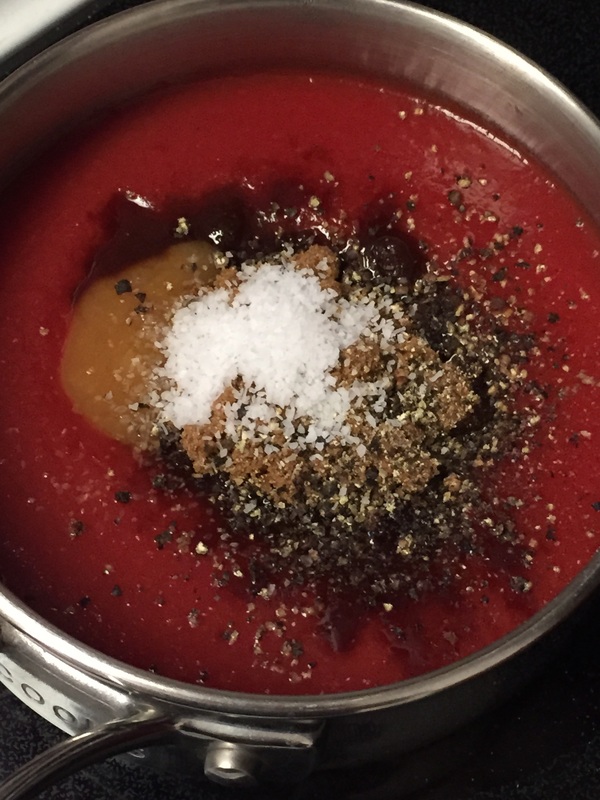 Once the sauce has cooled pour into food processor and pulse until garlic pieces are no longer visible. Drizzle 1/3 cup of olive oil in slowly while continuing to pulse. Set aside (this mix will not be thick). Prepare grill and heat one side of grill to high heat while leaving the other side on the lowest flame setting. Begin with chicken skin side down on hot side of the grill for 10 minutes or until a good sear is established. Move chicken to low side of grill, skin side up. Turn high side of the grill to lowest setting and cover grill. Let cook undisturbed for 20 minutes. Open grill and coat skin side with sauce, turn sauce side down. Cover and cook for another 10 minutes. Coat flesh side with sauce and flip, cover and cook for 10 minutes. After the initial 50 minutes, begin flipping ever 5 minutes while coating with sauce until chicken has reached an internal temperature of 170 degrees. I will sometimes turn up the heat in the last 2 minutes to get a little extra char on the chicken. I planned on making beef short ribs in the crock pot and was very disappointed at the grocery store when there were none available and none in the back. I spotted several packages of beef oxtail and decided I would try out my short rib recipe with the ox tails. The results were great! Serve this stew over some yellow corn grits for a dinner that will leave everyone’s tummy full. Start by combining the flour, paprika, salt, pepper and chili powder in a large bowl and combining with a whisk until well mixed. Toss the oxtails in the flour mixture. Next, heat up 2 tbls of the peanut oil in a large non-stick skillet and add your oxtails. Be careful no to overcrowd your skillet. Turn until the oxtails are browned on all sides (about 6-8 minutes). I was able to get all of the oxtails browned two batches. Transfer the oxtails to a 7 Quart slow cooker and add the remaining peanut oil to the pan and drippings from the oxtails. Add the sliced onions to the pan and saute until they begin to become translucent. 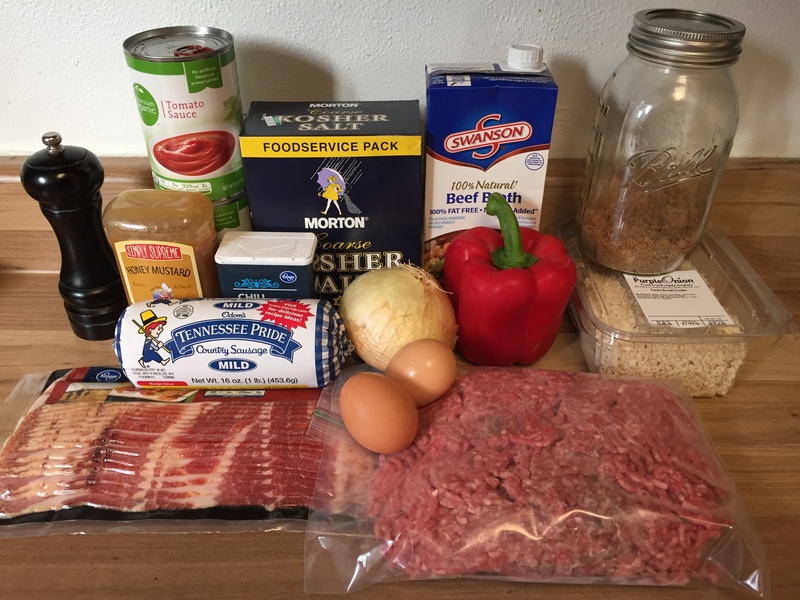 Add one bottle of root beer to the skillet with the onions with the tomato paste and scrape all of the drippings from the pan. Add the onions and sauce to the crock pot along with two additional bottles of root beer. Set your crock pot on HIGH and cook for 3 hours. 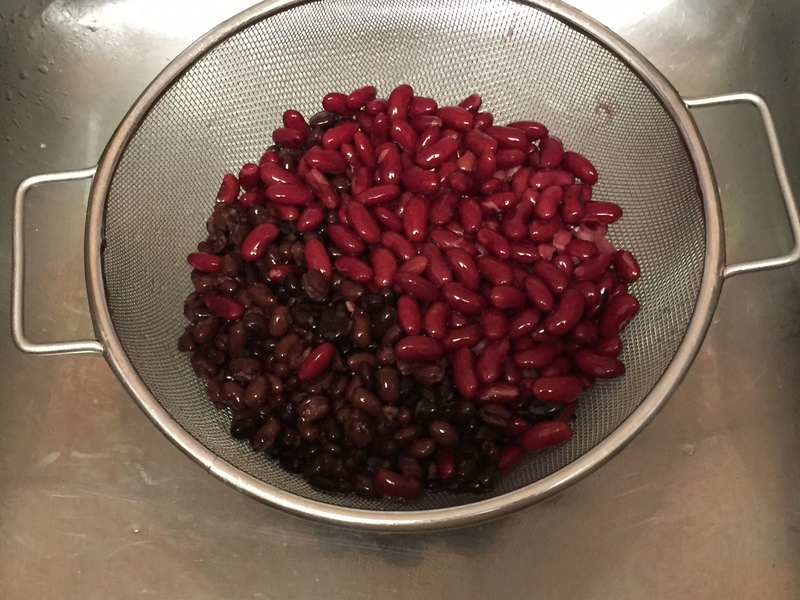 Leave your black-eyed peas on the counter in a bowl to thaw. We will add those after 3 hours. After the first three hours have passed on HIGH, open the lid and give things a quick toss. 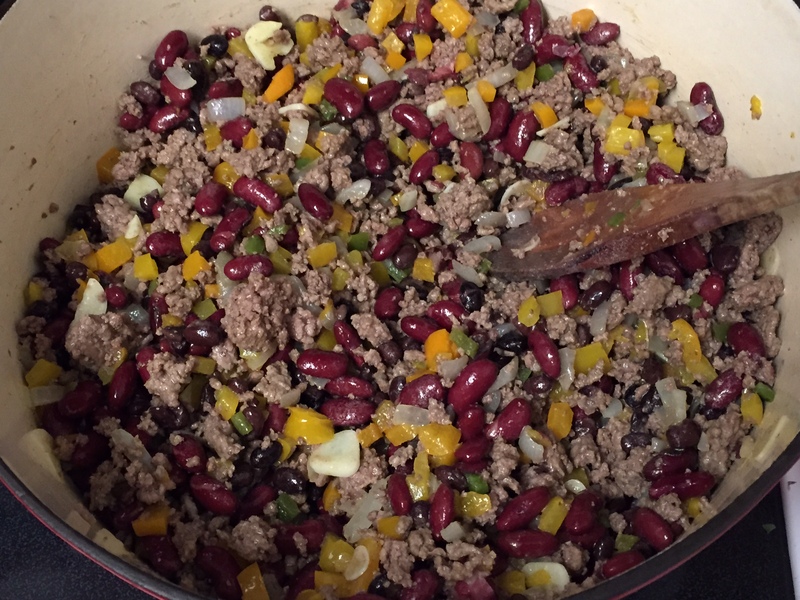 Pour in the thawed black-eyed peas and gently stir. Put the lid back on your crock pot and set it on HIGH for an additional three hours. After the three hours is up you will want to ladle some of the fat that has risen to the top off of the stew. You will also be ready to taste and adjust the salt and pepper to your preference. I went out to my herb garden and picked some fresh flat leaf parsley right before serving. This is optional but offers some pretty greenery to the finished dish! This is a fun twist on a French classic, Coq au Vin. This is a little less heavy than versions made with red wine but that doesn’t mean that it is lacking in flavor, this dish is out of this world. In a large cast iron dutch oven, render the fat out of the bacon and reserve the bacon pieces for later. Leave the bacon fat in the dutch oven. 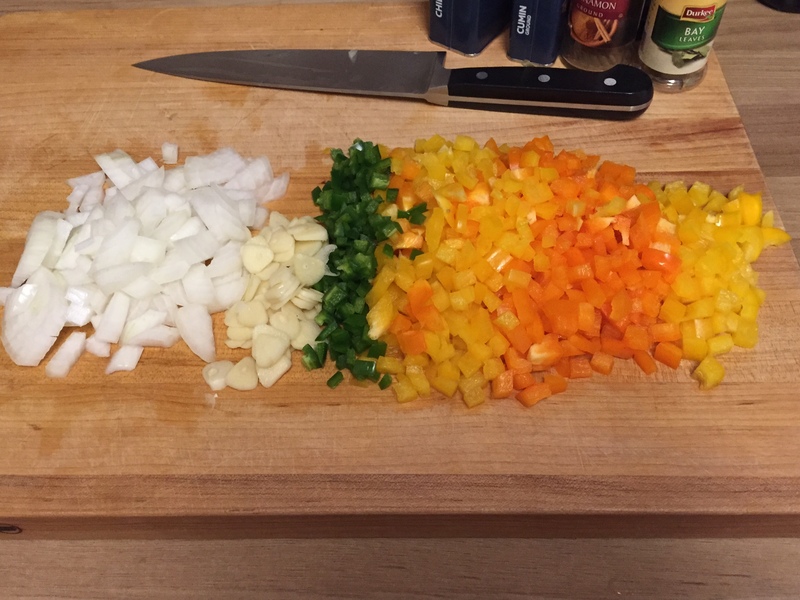 Peel and half the onions, dice the celery and carrots and remove the ends from the gloves of garlic. Add the onions, celery, carrots, rosemary, thyme and garlic to the bacon fat over medium-high heat and cook until they begin to become translucent. Once the veggies have started to soften, add the mushrooms and cook down until they wilt. Add the entire bottle of white wine and continue to simmer over medium heat. Add salt and pepper. Prepare the chicken by separating the thighs, legs and breasts. I always cut the breasts in half to create 8 pieces of chicken. Sear the chicken over high hear in a non-stick skillet until the sides are slightly browned – but not cooked through. Add the browned chicken to the put with enough chicken stock to cover the chicken. Put a lid over the chicken and simmer on medium heat for 45 minutes. Remove the chicken from the sauce and place on a platter. Add 1 cup of the sauce to a food processor and add 2 tablespoons of corn starch. 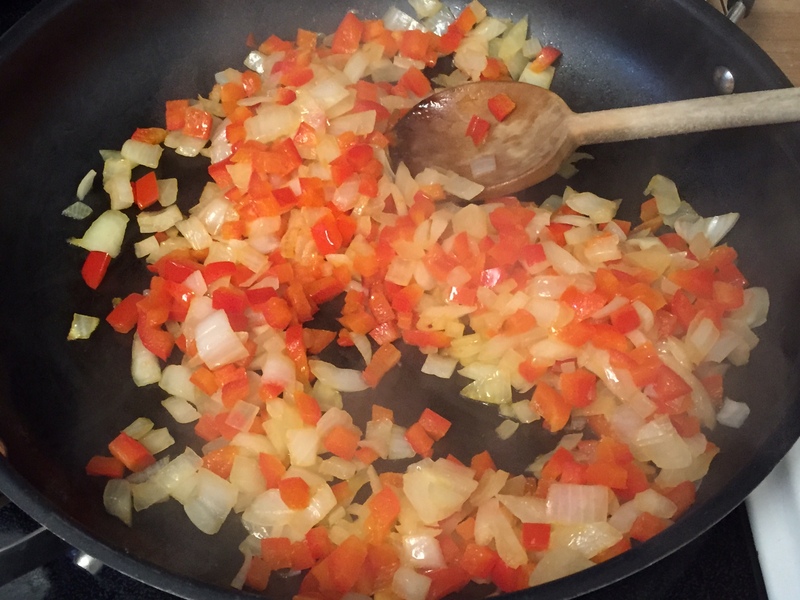 Blend until the starch is dissolved and add the mixture back to the simmering liquid. Stir until the sauce thickens. Pour the sauce over the chicken and serve with a sprinkling of parsley. This is a perfect meal for a cold evening. I served this over mashed cauliflower and celery root and received rave reviews from my friends and family. 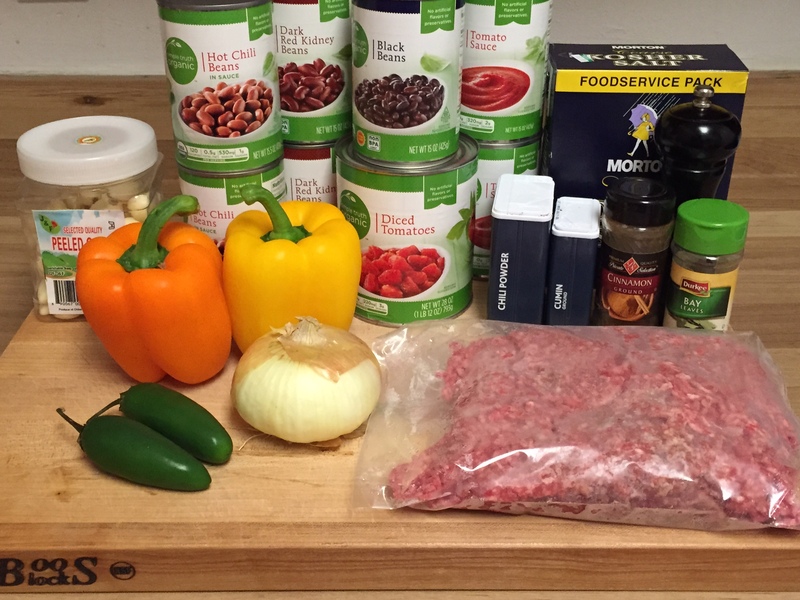 Football Season = Chili. 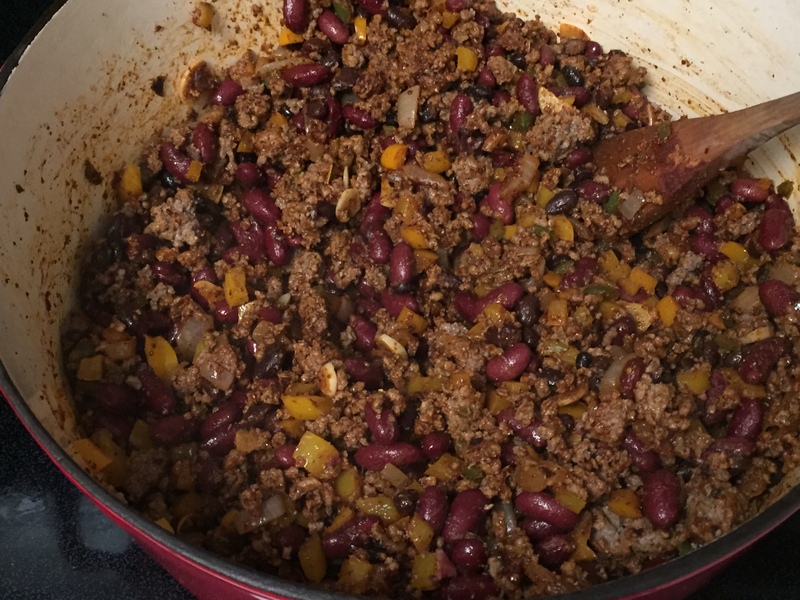 I’ve never seen two recipes for chili that were the same. Everyone has something unique that they do to make theirs special. 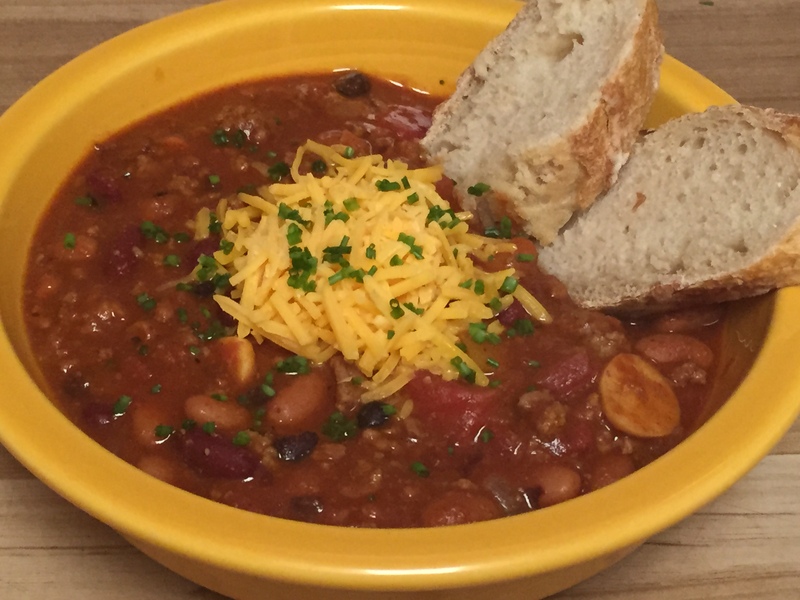 If you are looking for a recipe to enjoy or need a starting point to evolve your own recipe from, try my chili. 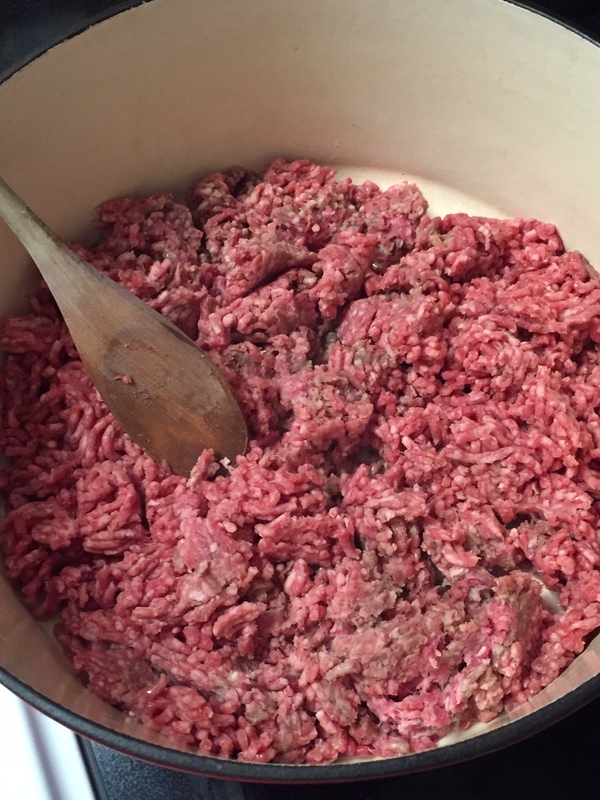 Begin by browning your ground beef in a large cast iron dutch oven (mine is enameled but good ole cast iron is fine). I always add a little olive oil to the pot before I add the meat. 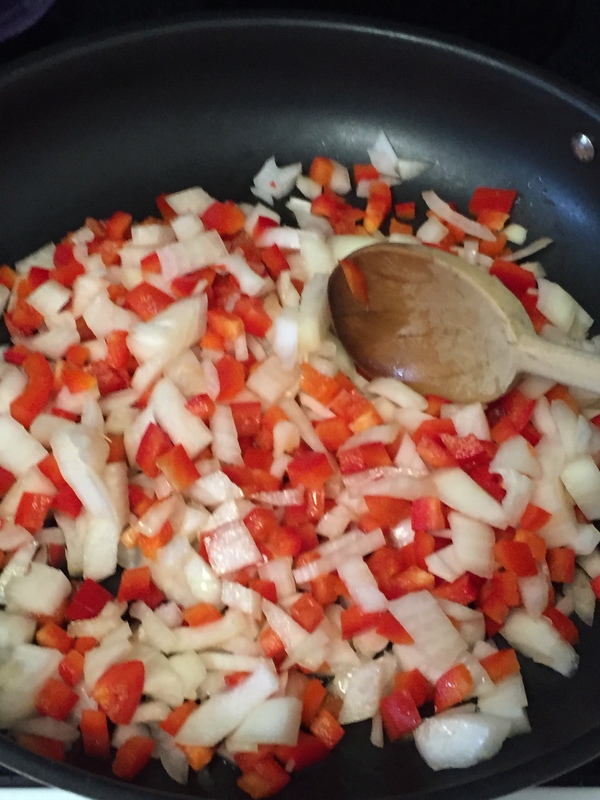 Chop up the onion, garlic, and peppers evenly while the beef is browning. 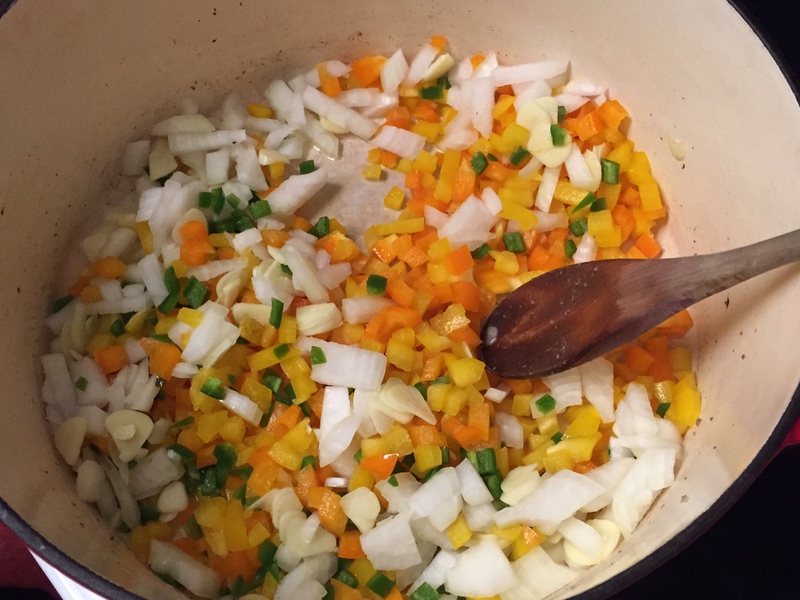 Drain the meat in a colander and add the chopped veggies to the skillet with a little olive oil. When they begin to turn translucent, add the meat. 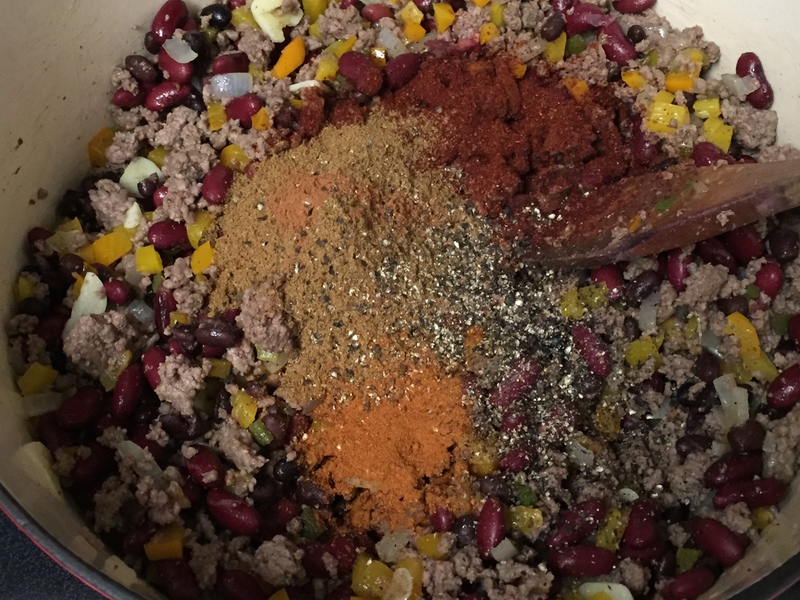 Drain all of the beans (except chili beans) and add all of them to the meat and veggie mixture. Once everything is coated add the tomatoes and the tomato sauce, 2 bay leaves and 1 cup of water. 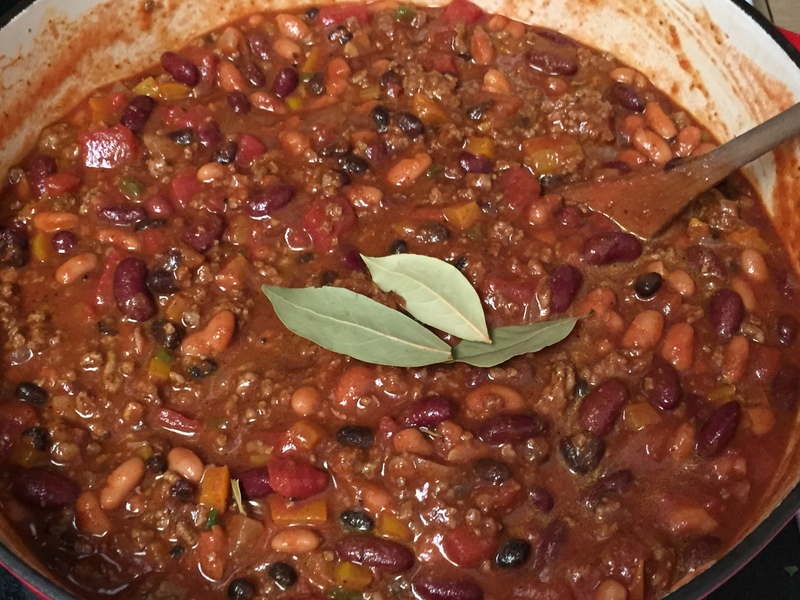 Cook, covered for 1 hour over medium heat until the beans are cooked through and all of the flavors have combined. 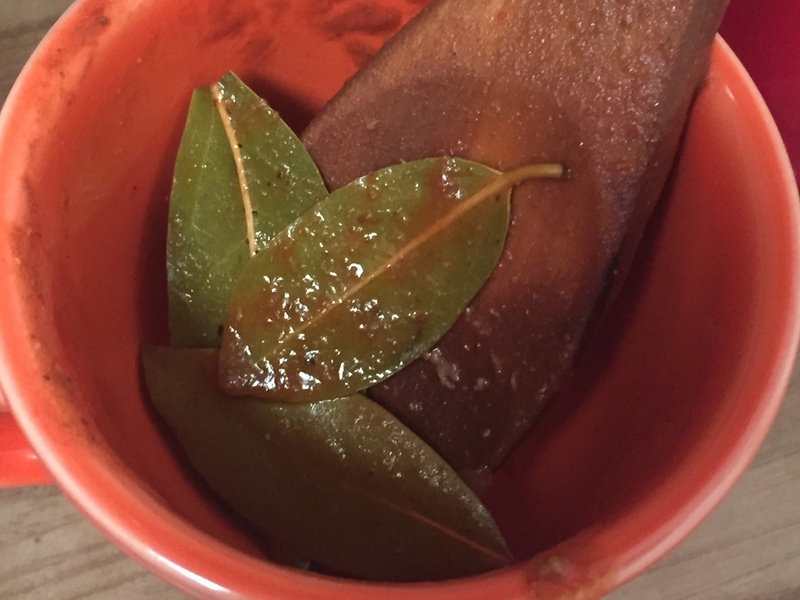 Be sure to remove your Bay leaves prior to serving! Those things are sharp but offer so much flavor! 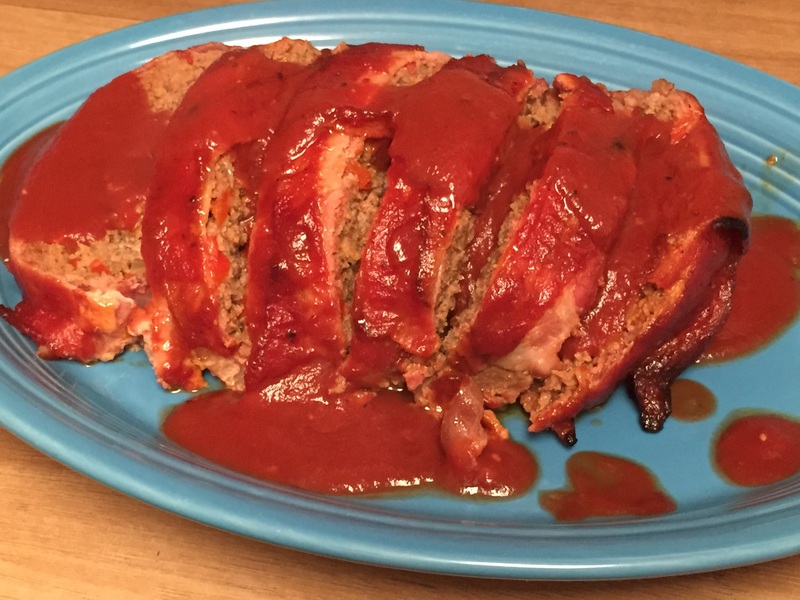 There are a million meat loaf recipes out there and each one is great in its own way. Some meat loafs have brown gravy, some red gravy and I have even seen green gravy! 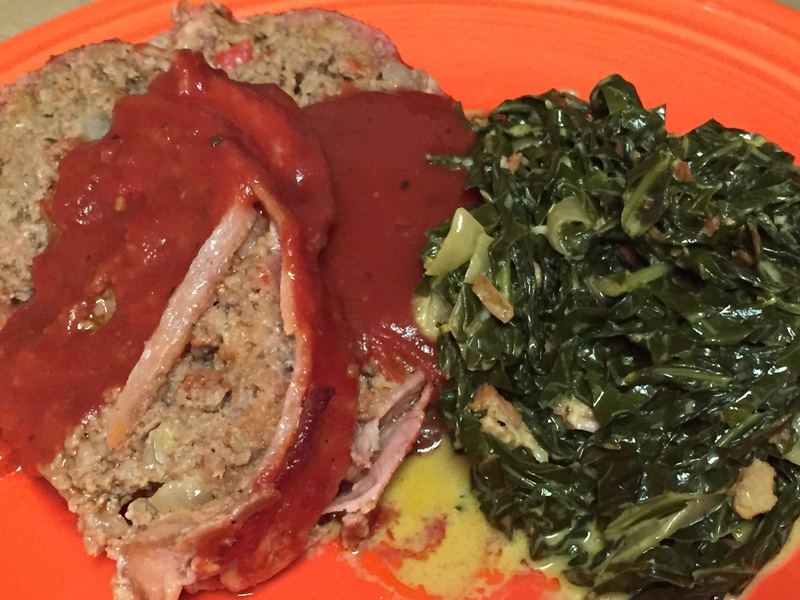 This is my version of meatloaf which is a combination of many, many recipes. 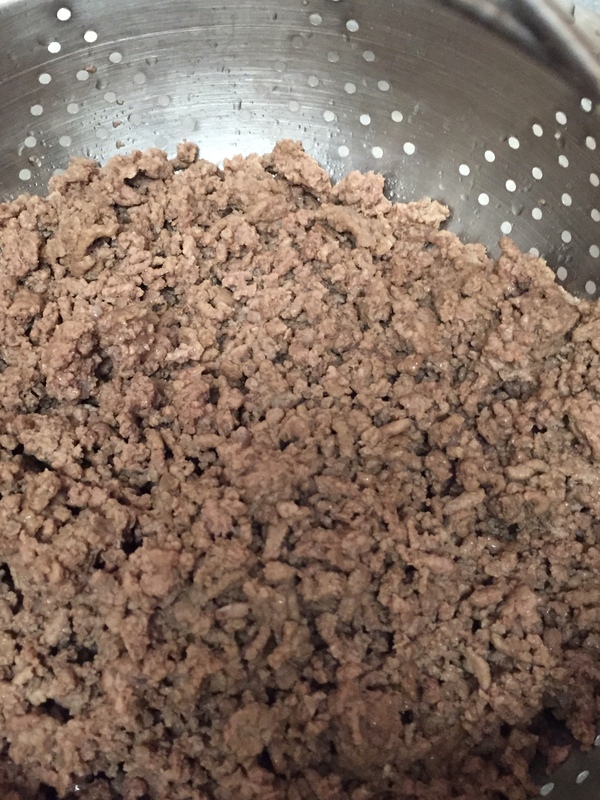 Combine meat, sausage, 1/2 can of tomato sauce, eggs, bread crumbs, chili powder, salt and pepper in a large bowl. 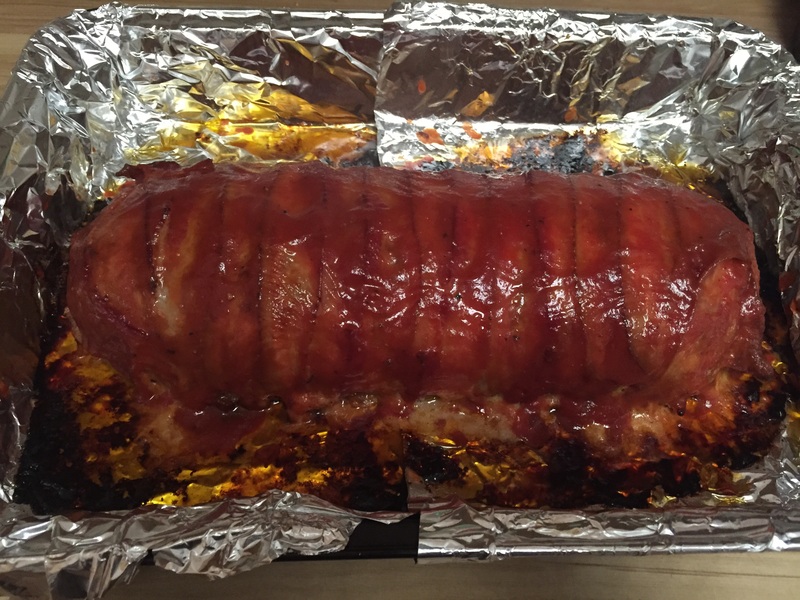 Shape into a roll in a foil lined roasting pan and wrap with bacon. In the oven for 1 hour at 375 degrees. In the meantime, prepare the sauce. Add 1 1/2 cans tomato sauce, brown sugar, mustard, salt and pepper. Wisk over low heat and cover while meatloaf cooks. 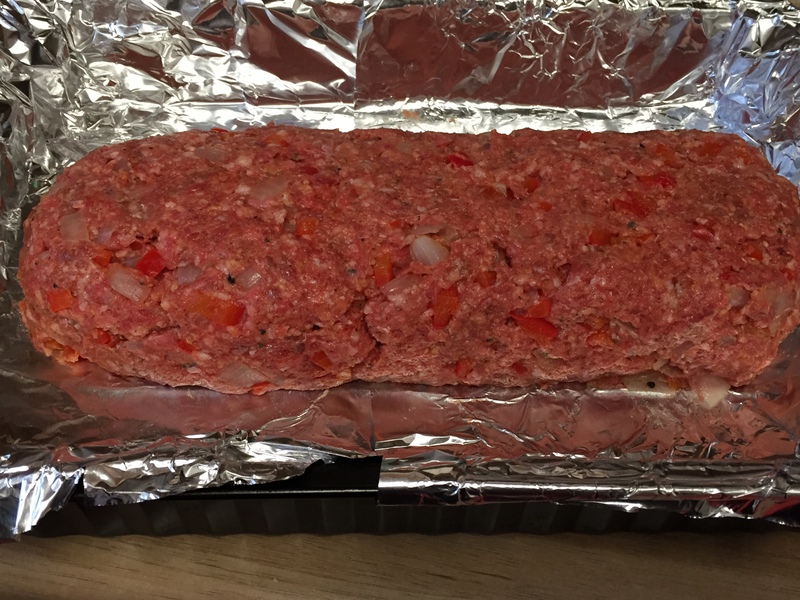 After 1 hour, remove meatloaf from oven and turn on broil. 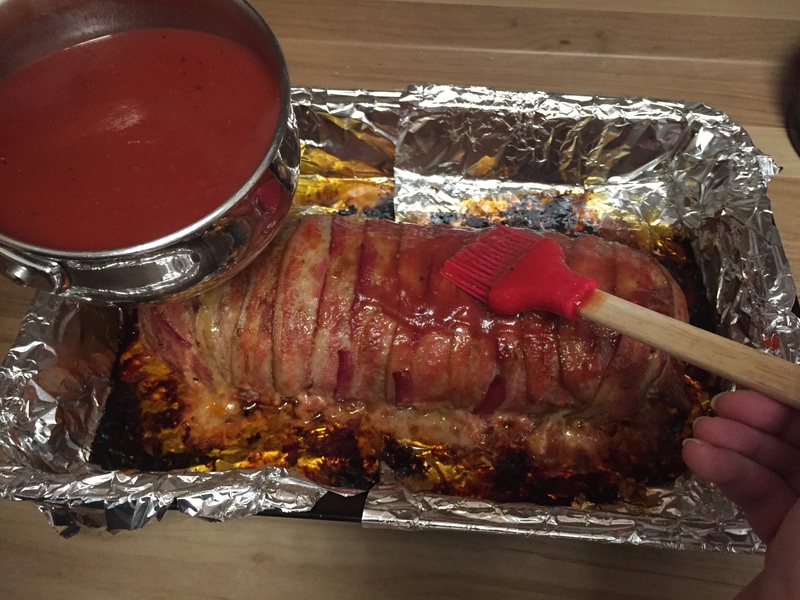 Brush the meatloaf with the sauce and broil 3 minutes, remove, coat again and broil 3 minutes longer. 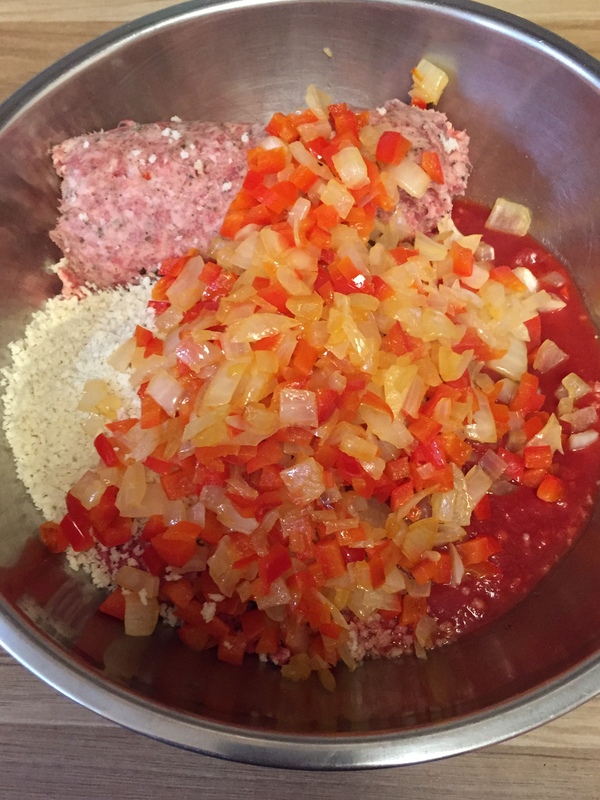 You should have plenty of sauce to serve with your meatloaf. Use the bacon slices as your slicing guide. Enjoy! If you like my blog, please sign up to receive email notifications!